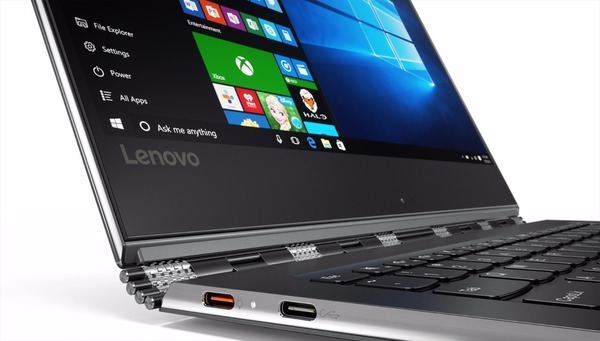 The IFA 2016 ongoing at Berlin saw the latest launch of Yoga device from Lenovo. The new device will be known as Yoga 910. Yoga series is a much applauded series of device from Lenovo solely because of dynamic features offered. The new device will be having latest Intel Kaby Lake Processors. Yoga 910 is having a dimension of 12.72*8.84*0.56 inches. The device weighs nearly 3.04 pounds. Yoga 910’s unibody metallic design gives it an elegant look. The device is having a 3 sided confined 5mm display bezel that adds to its beauty. The Watchband Hinges helps you to turn Yoga 910 in whatever position you want. The normal Yoga 910 features a 13.9 inched FHD display screen. But you have the advantage of having 4K display also. The resolution comes to be 3840*2160 pixels accompanied with IPS technology. This makes the display of Yoga 910 sharper with extensive range of colours. Yoga 910 is functioned with the help of latest 7th Generation Intel Kaby Lake processor. With the support of 16GB RAM and 1TB Solid State Storage, Yoga 910 seems to be invincible. Apart from this you can also have the advantage of extra storage with the help of microSD memory card. Windows 10 or Windows 10 Pro OS makes Yoga 910 yet more powerful. Graphics is supported by Intel HD graphics. The device is also characterized by Hello Support. Yoga 910 is having WiFi connectivity with 802.11ac and also Bluetooth connectivity with v4.1. The device also holds one USB of v3.0 Type-C for faster data transfer, one USB featuring Always-On Charging along with supporting Audio facility and another USB of v2.0 Type-C for charging purpose. The battery of Yoga 910 is too extensive that it can support nearly 9 hours local video playback. It means it can hold the device for more than 10 hours while using it normally. Lenovo will be releasing Yoga 910 in Champagne Gold, Gunmetal, Platinum and Silver colour variants. The device will make its way towards the shelves by the beginning of October this year. Yoga 910 is tagged with a price of $1671 or €1499.